It is not uncommon for storage to be needed as a separate service or as part of customers’ property removal project. 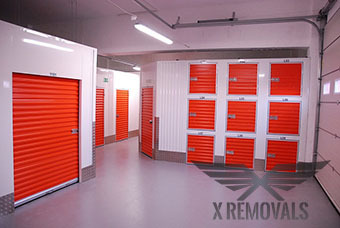 As X Removals aims to cover all customer requirements seamlessly and thoroughly we provide specialised storage solutions in London at excellent prices. Requesting and using our storage options is quick, easy and straightforward. The storage service can be customised as per individual needs and wants, making everything all the more convenient. Our storage solutions are available on short and long term basis so we can keep your good safe and secured for as long as necessary. There is no minimum contract duration. We are able to provide instant storage quotes over phone or email. We operate and maintain secured, licensed storage facilities where items are kept safe through video surveillance and round the clock manned security. For your convenience we offer various storage space options in the form containers, crates etc. so we can easily arrange and provide the necessary storage space and save people money from having to hire storage space they don’t really need. For more cost efficiency, we can also arrange for shared storage, where a container stores the items of more than one customer. Of course items will be clearly separated, labelled and packed if necessary. Access to items is always done in the presence of one of our representatives who ensures other people’s belongings remain untouched in the process. Our storage solutions are flexible and convenient. Items can be taken into storage as is, or as part of a property removal service we have organised for you. We can arrange for items to be picked up at a convenient time and day of the week from a customer specified address, then have them delivered to a prearranged location at a requested time (after the necessary storage duration). This can be done seven days a week, including public holidays under flexible hours. Of course, packing and securing of goods prior to having them put in storage can also be requested. We will pack and secure your valuables using high durability packing and wrapping suppliers. Customers have twenty four hour access to their items in storage in London. For small number of items we are usually able to arrange for on-the-spot release from storage, however if we are to release large amounts of goods, and/or have them transported to customer specified address we will need a week’s prior notice.